Posted on March 29, 2013	by Judah Gutwein, L.N.H.A. We have put together this excellent guide to Excercise and Flexibility for Adults 60 and older. I hope you enjoy it and find it to be informative and empowering! Regeny Nursing emphasizes senior fitness! Muscle weakness is the major reason elderly Americans need to incorporate some type of exercise into their daily lives. 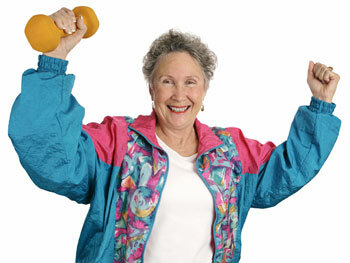 Many older people think they are too old or too frail to exercise. This is an old myth. Physical activity is beneficial for your body, heart, and mind at any age. Exercising helps seniors grow stronger, more confident, and more independent. Older people who become more active, including those with medical conditions, also feel better, have increased energy, and a more positive mental outlook. This article is designed to help people understand how to enhance the quality of life, simply and safely, by becoming more physically active. No matter how old you are, or how out of shape you may be, even a little exercise can pay healthy rewards. Sarcopenia is the name medical science has given to the phenomenon of muscle wasting as we age. As the body’s muscle mass decreases, fat begins to accumulate. The higher the proportion of fat in our bodies, the slower our metabolism, which makes it more difficult to be active. In turn, this lack of activity limits our ability to shed fat and increases the problem of muscle weakness. This is the “Sarcopenia Cycle.” It is a process most of us don’t notice until we realize how hard it has become to climb stairs or simply get up from our favorite sitting chair. Regular exercise is the only way to slow this downward progression. It is for this reason that strength training and other forms of muscle-strengthening exercises are so important to a long and healthy life. Building muscle tissue is also important in order to prevent bone breaks. Building muscle tissue around bones is the best means we have of protecting them from the weakening effects of aging. When your leg and hip muscles are strong, you are less likely to fall, and should you experience a fall, it is less likely to result in a fracture. According to the National Institute on Aging, there are four areas of fitness that are key to staying healthy and independent as long as possible. • Strength Training: These activities such as weightlifting, calisthenics and resistance training build muscle, and help protect bones and prevent diseases associated with weak bones, joints and muscles, such as osteoporosis. • Endurance: Aerobic exercises increase your breathing and heart rate. Not only do these activities improve stamina, they reduce the risk of certain diseases, such as high blood pressure, heart disease and diabetes. • Flexibility: Increased flexibility and freedom of movement come primarily from stretching exercises. They also help prevent injuries and improve posture. Stretching is especially important for people with weak backs, arthritis, or other joint pain. • Balance: Although balance can deteriorate with age, it can be improved through exercise. Good balance helps prevent falls, which are a major cause of injuries that limit function and independence. First things first. See your doctor. Don’t start any exercise program without a physician’s approval. through a full range of motion and holding the fully stretched position for 15-30 seconds. house, active gardening or carrying groceries. you can gradually build in length and intensity. Walking is an excellent form of endurance exercise because it can be done at your own pace and at any time. Walking strengthens muscles in the lower body, helps build new joint bone and tissue, and helps slow osteoporosis. Swimming is another ideal exercise, particularly for healthy active seniors. It provides a great workout and the water cushions against high impact. Dancing is social, fun and a healthy exercise. The various styles – from ballroom to polka – allow each person to work within his or her individual target heart range. • Balance and Flexibility: Tai Chi is one of many exercises that can help older adults reduce the risk of falls and injuries related to poor balance. This ancient martial arts form, which has only recently become popular in this country, uses slow, graceful and precise body movements to improve balance, strength and flexibility. Just about anyone, at any age, can incorporate some type of physical activity into a regular routine in order to improve his or her health. Again, the first step is to see your doctor. His or her approval is essential to the safety and success of your program. Don’t believe the myth that being frail and helpless is a part of growing old. If we sit back and do nothing, we are doomed to lose 20 to 40 percent of our muscle and, along with it, our strength. Activities that produce even small changes in muscle size, changes that you may not even see, can make a big difference in both your physical and emotional well being. This entry was posted in HealthCare News, Senior Care and tagged exercise program for seniors, exercises for seniors, fitness program for seniors, how to stay fit, regency nursing senior care, senior fitness, senior fitness guide, senior fitness program, senior fitness programs. Bookmark the permalink.